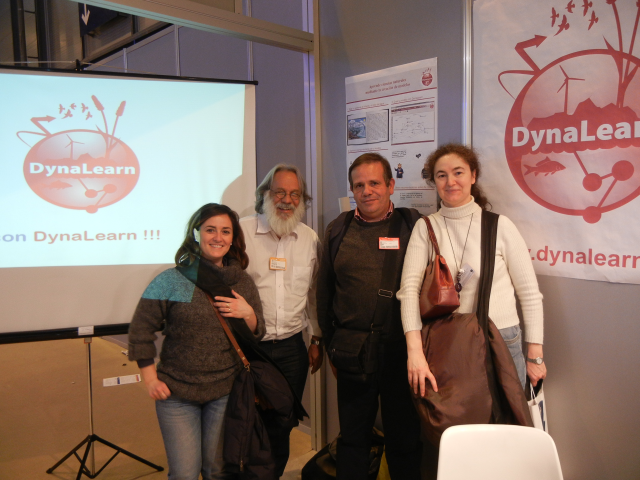 The DynaLearn project was invited to present some of its results on January 20th, 2012, in the context of the eMadrid network on e-learning and education. 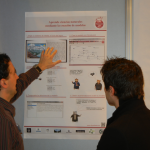 Oscar Corcho, who represented DynaLearn in this seminar, explained how semantic technologies were being used in the context of DynaLearn for the grounding of terms in qualitative reasoning models, and for the generation of feedback based on the models created by other students or teachers. 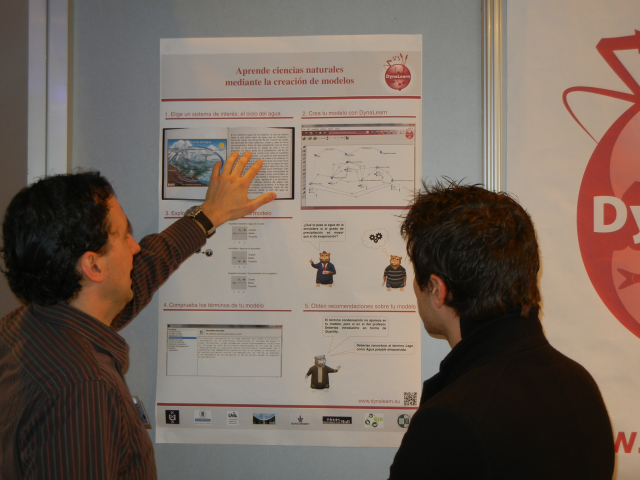 The event had a participation of around 50 persons, and contained presentations from GNOSS, a Spanish company specialized in the development of social networks around educational resources, and OpenCourseWare UPM, which is currently transforming many of the existing OCW courses’ metadata into Linked Data. 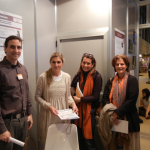 From 22 to 26 February, in Madrid, DynaLearn was presented in AULA, an international fair on educational products. At least two members of the project (UPM and FUB) were always available to meet students, teachers, parents and business people, and to explain what is DynaLearn, to give demos, to show videos and to discuss the possibilities of using the software with secondary school students, the majority of our visitors, and at the university. Many of our visitors were teachers, and for them it was a surprise to see such a modeling environment and simulations without numbers. 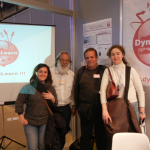 The diagrammatic approach to modeling was also a feature they liked and recognize it as a point in favour of introducing DynaLearn in the classroom. Didactic materials are being uploaded to the website, and further contact with users and stakeholders will create the conditions for an increasing number of users to explore educational capabilities of DynaLearn. 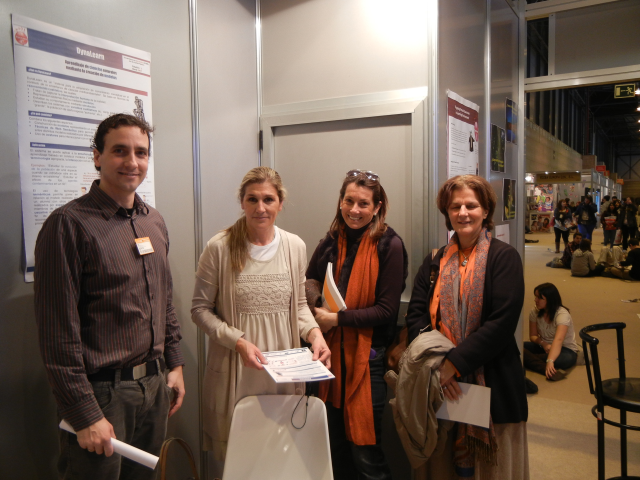 We are grateful to the colleagues of UPM and FUB, who provided support for DynaLearn at AULA! Our contribution “Increasing Learners’ Motivation through Pedagogical Agents: The cast of Virtual Characters in the DynaLearn ILE” to Lecture Notes in Artificial Intelligence (LNAI) has been accepted and will be published in the next volume. 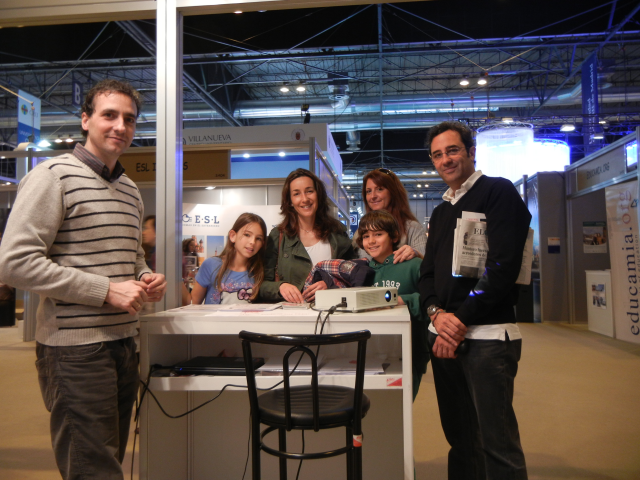 The latest developments of DynaLern (software, models, educational materials) are being shown to students, teachers and businessmen in Madrid, from the 22 to 26 February, in the “Salón Internacional del Estudiante y de la Oferta Educativa” (AULA 2012). Based on previous years, four thousand people are expected. 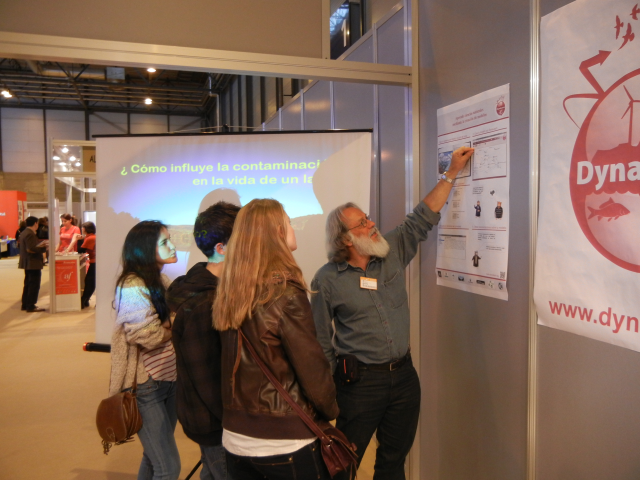 Visitors will be received in a nice stand with posters, videos and people from UPM and FUB to explain our project. A new post will comment the reactions to DynaLearn! DynaLearn will be present in this year’s edition of AULA, the INTERNATIONAL EDUCATIONAL OPPORTUNITIES EXHIBITION, to be held in Madrid between 22th and 26th February. This will be a good opportunity to present DynaLearn to the general public, especially teachers, students (of all levels), and experts in educational science. 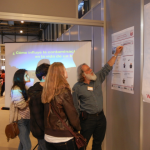 People will discover DynaLearn by means of demo videos, posters, hands-on sessions, and the explanation of our experts from University of Brasília (FUB) and Universidad Politécnica de Madrid (UPM). Come and enjoy it! Within the Master Thesis “Understanding physical mechanisms of braided river system development by using conceptual and qualitative systems modeling” DynaLearn is used as conceptual modelling tool at BOKU. Aim of this work is to develop a causal understanding of the different factors influencing the development of a specific morphological river type, the braided river system. A causal systems understanding is a pre-requisite for any process based management and restoration of river systems. Goulart, F.; Salles, P.; Saito, C. H. and Machado, R. B. 2011. How does matrix agricultural intensification of the matrix will affect bird’s species inhabiting a savanna-forest mosaic? A qualitative modelling approach. In Agell, N.; Roselló, L. (eds.) Proceedings of the 25th International Workshop on Qualitative Reasoning (QR2011). Barcelona, Spain, 16-18 July 2011, pp. 51-59. Goulart, F.; Salles, P.; Machado, R.B. 2011. How agricultural matrix intensification may affect forest understory birds? A qualitative model on stochasticity and immigration. In: Agell, N.; Roselló, L.
Souza, A.; Sá, I. G.; Leite, G.; Portella, A.; Aquino, P. P. U.; Costa e Silva, P. A.; Wilhelms, L. H. and Salles, P. 2011. Evaluating the use of qualitative reasoning models by secondary school teachers. In Agell, N.; Roselló, L. (eds.) Proceedings of the 25th International Workshop on Qualitative Reasoning (QR2011). Barcelona, Spain, 16-18 July 2011, pp. 140-146. Souza, A.; Leite, G. and Salles, P. 2011. Using qualitative reasoning to model wind power production in coastal zone. In Agell, N.; Roselló, L. (eds.) Proceedings of the 25thInternational Workshop on Qualitative Reasoning (QR2011). Barcelona, Spain, 16-18 July 2011, pp. 132-139.